Growing up my family made a lot of Tex Mex style foods. Totally understandable when your mother is from southern Texas. Enchiladas, tacos, and fajitas were regulars at the dinner table. Actually make that present tense since I still love to make them as an adult. The issue is, sometimes I do not want to take the time to prep and make the more labor intensive items. I tried the baked fajitas once, never again. Tacos, well those are so easy there is no real time saving trick to those. Except maybe to buy shredded cheese versus the block. But enchiladas are a whole different animal. You have to lightly fry the tortillas or they just crack and break. Then you have to fill each one individually. Then you roll them. Oy I am getting tired just thinking about it. A few years ago I switched to making a lasagna style enchilada bake where the tortillas were the pasta between layers. But even that can be problematic with the whole square pan round tortilla bit. Plus it only reheats OK, nothing spectacular. One day I had a EUREKA! moment. 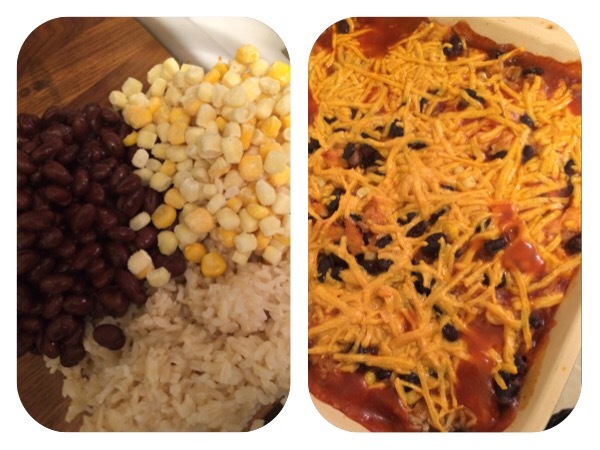 What if, instead of say having rice on the side of enchiladas…it becomes the enchilada? Thus my favorite casserole was born. The proportions below make 4 generous servings. Marinate the chicken as you prefer – I used coconut lime hot sauce and lime juice for an extra kick. Dice the chicken into bite sized pieces. In a medium sized bowl, combine together diced chicken, brown rice, black beans, and corn together. Pour into 9”x9” baking dish. Pour the enchilada sauce over the top of the mixture. Now I prefer saucy-er dishes so I used 1 ½ cans of sauce but that is just my own little quirk. Top with cheese. Bake for 30 minutes till cheese is melted and sauce is bubbling. Right Picture: Ingredients pre-mix. Left Picture: After baking. Squeeze the lime juice over the top and garnish with the green onions and cilantro. Serve immediately. Thanks for posting this recipe, looking forward to trying it! You will have to let me know how you like it!